Another Saturday means the start of another Chain Writing Game from Kerrie. This week, we start off following Jadir. Come and have a go. Join in. Help take the story where you want it to go. Throwing caution to the wind, he decided that his friends ridiculed him enough. Today it stopped. Today he proved to them who he really was and that he had courage, even if that courage was fading fast. He needed to start climbing now, or he would chicken out and that would be it. Thinking about fame and fortune, and throwing his remaining alcohol on the floor, he ran at the wall and leapt, grabbing hold of a handhold and started up. All he needed to do was get part way up so there would be no going back. 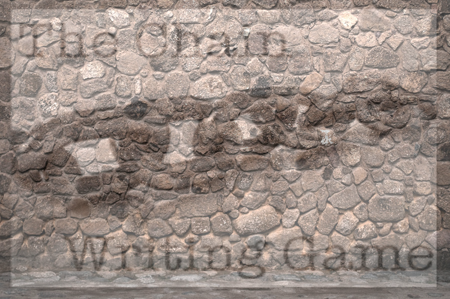 This entry was posted in Fiction and tagged Chain Writing Game, CWG, February, Flash fiction, Kerrie Salsac, Postaday. Bookmark the permalink. It all stopped unfortunately, Kerrie had commitments other than blogging. Although this story did conclude. I can’t remember what happened with it. I like that you included his reasoning for continuing on. I like to know a character’s “motivation.” I hope Jadir is a really good climber. He might need that skill once he gets to the other side. 😉 I was doing research on one of my favorite “things” last night for just this situation…[evil laugh]. Climb, Jadir! I hope once he sees what’s on the other side he’s not going to regret leaving his alcohol behind. Are you suggesting that Jeremy might throw horrifying creatures and people at Jadir? There’s more to this Al?